SARRC ultra trail runner with multiple food intolerances. I have experienced a range of symptoms affecting my gut over the last few years. Four years ago I started long distance walking and changed to running and cycling. I always felt nauseas and struggled to eat during and after events. I constantly felt tired and couldn’t work out what the problem was. I found it difficult to train and participate in cycling and running events successfully. I visited a couple of dietitians and Tanya referred me to Steph because of her expertise in sports nutrition and work with identifying food intolerances. 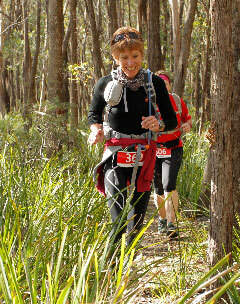 I did not finish The North Face 100 km event in 2011, which we now know were due to food and chemical intolerances. Steph and I worked through a rigorous process of food and chemical eliminations and different medical food intolerance tests. We developed a daily food diary to record reactions, the amount of food and drink consumed and the training regime. With a considerable change of diet and increase in food intake, I quickly improved in my fitness, sleep patterns, and general wellbeing. We keep in touch through emails and the occasional visit. Any concerns I have are dealt with promptly and supported by research. We make changes to diet and I continue to feel stronger and compete in various cycling and running events with more success. This year I completed the North Face 100 km event using Steph’s advice on nutrition planning and timing. Steph’s confidence, professionalism and encouragement in my ability to complete the ultra marathon far surpassed what I would expect. An example of this was Steph competing in the North Face 100km, followed my progress and continued to support me until I finished. Dedication not only to her own running, she dedicated time to me via text messages, making sure I was eating and drinking sufficient. She could have been sleeping at this time. We continue to work on my food challenges, I have improved so much that running long distances is much easier. Steph has a wonderful sense of humour and is totally committed to her clients to ensure they receive the best possible care and advice. Without Steph’s support I feel that I would have retired from running and cycling. Thank you Steph. Can’t wait to have a good red wine again! !